By Simantini: If I’m not wrong, I was introduced to Faces way back in 2010. I was out shopping makeup for my friend who had just been offered a job in Indonesia, and being the novice in makeup that she was, she, obviously – sought my help. So, there we were, in New Market, going through stacks of makeup products and voila! There it was! FACES. And here I am, going back to my long loved brand, with the Faces Long Wear Eye Pencil in Grey, Smoke and Black Sparkle. 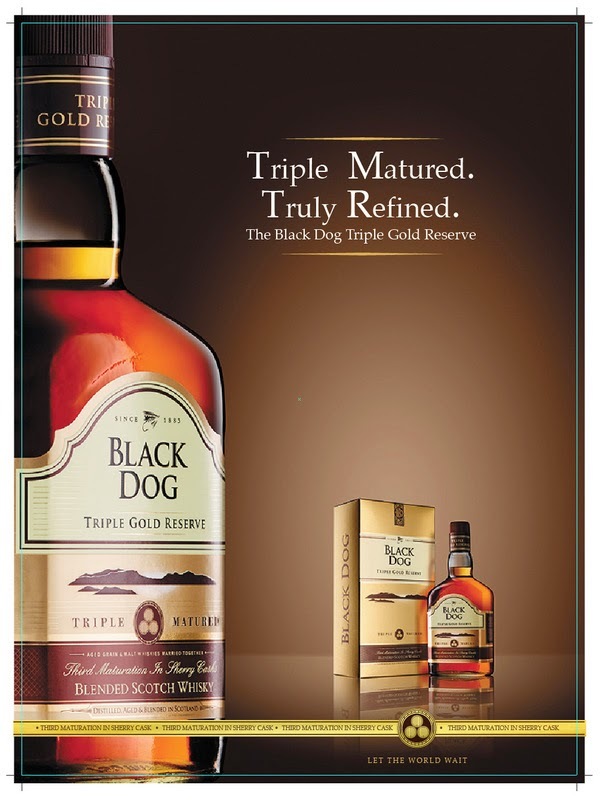 PRICE: As I got the pencils from Shoppers Stop, I had to pay the exact MRP 449INR for each. But these pencils are available on various online websites as well, and I am sure you will be able to bag a deal or two every now and then. GREY is dark enough and probably a shade lighter than black. 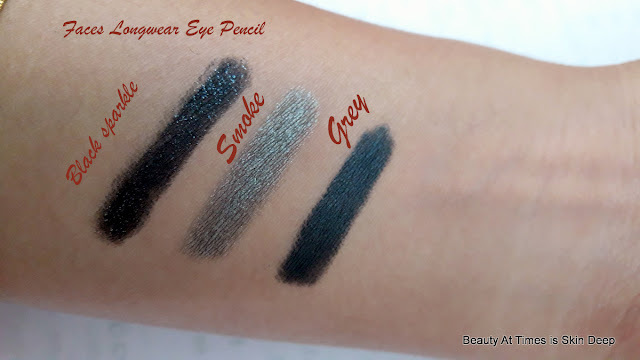 If you are a sucker for smoky eyes, then you should try GREY and SMOKE together, and just a hint of BLACK SPARKLE on the upper lash line to get the ultimate party smoky eye. PACKAGING – The Faces eye pencil packaging is sure to give you bouts of nostalgia if you have used them earlier as well. A transparent plastic cover is the only packaging that they maintain, and I find it really sleek. 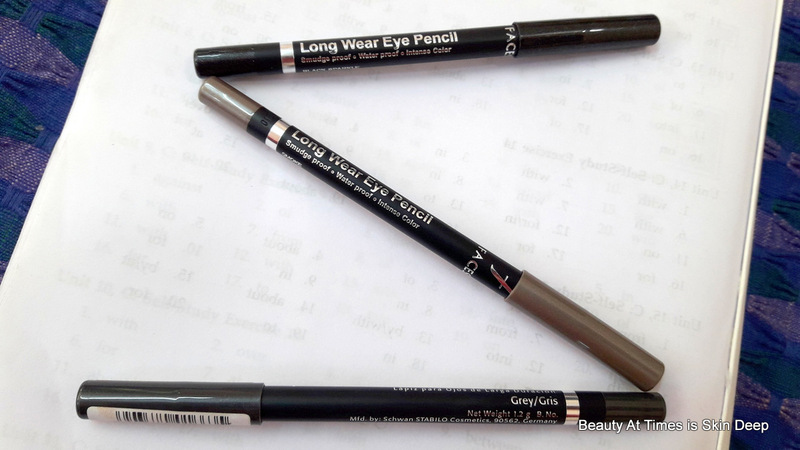 EXPERIENCE – Now I must be honest and say that I don’t have any complaint regarding these eye pencils. They are rich, smooth, absolutely long wear and almost smudge proof. The only problem is the fact that I need to sharpen it with a pencil sharpener. I just find it wastage of money and material when some of the product is wasted with the sharpening. PROS – There are many advantages of wearing this eye pencil. 1. It is long wear, and I have been out for 13 hours with this during summer months, and it has been 90% intact when I have been back home. 2. It is smudge proof. Though the outer corners of the eyes tend to wear off with time, on an average, this eye pencil is smudge proof, and you need a good cleansing lotion or make up remover to remove it. 3. The feel of the eye pencil is very smooth. It is not the regular eye pencils which are a bit on the harder side. I don’t remember any other eye pencil having the same smoothness as the Face Long Wear Eye Pencil. 4. Richly pigmented as they are, you don’t need to apply them again and again. They give you the desired shade with a single stroke. 5. GREY is good for formal days, while BLACK SPARKLE simply glams up your evening outfit. And as for SMOKE, combine it with either or the previous two pencils and apply on the lower lash line as well to get a quick smoky eye. 1. 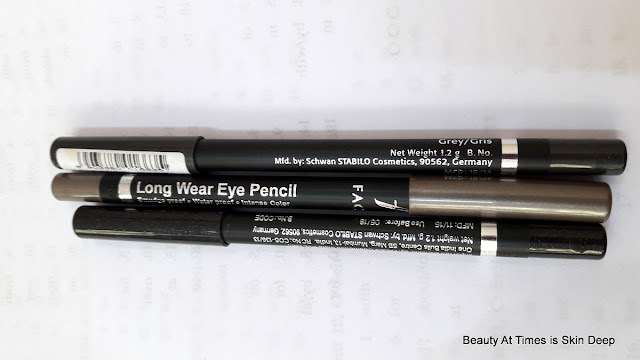 The price is pretty much high, when you compare with the other quality eye pencils available in the market. 2. Sharpening the pencil wastes some amount of it, and that does not at all give me mental peace. VERDICT – Summing it up, these pencils are not only long wear and smudge proof, but also of great quality. I would suggest that you don’t use them on a regular basis because, come on, we need to look into our purse as well, right? So for the days which demand long hours and gorgeous eye makeup, these pencils are great to create a smoky eye. SHALL I REPURCHASE? Absolutely! I have loved the brand since the day I was introduced to it, and their eye pencils are absolutely gorgeous.